After an extensive, resort-wide $24 million dollar renovation, the resort extends hospitality that is indigenous to the Hilton Hotels and Resorts throughout the world. The award-winning, 563 suite, Pointe Hilton Squaw Peak Resort hotel in Phoenix, Arizona is home to the Hole-in-the-Wall River Ranch - a water wonderland of family fun with acres of pools, waterfalls, a lazy river for tubing, waterslide, the prairie dog putting course, four lighted tennis courts and Coyote Camp. 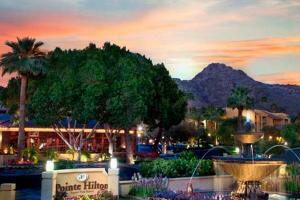 Located just 10 Miles from the Phoenix Sky Harbor Airport.